Steven Universe made its highly anticipated return last night with an episode dedicated to one of the shows most intriguing characters: Garnet. It was an episode that teased big reveals about the character fans have waited ages to hear, but it was also an episode where the biggest questions had the simplest answers. “The Answer” might be a small pit stop in Steven Universe’s ongoing story about the Crystal Gems working with Peridot to defeat a giant monster threatening to destroy the Earth, but in terms of the show’s highly secretive worldbuilding, it was a standout. 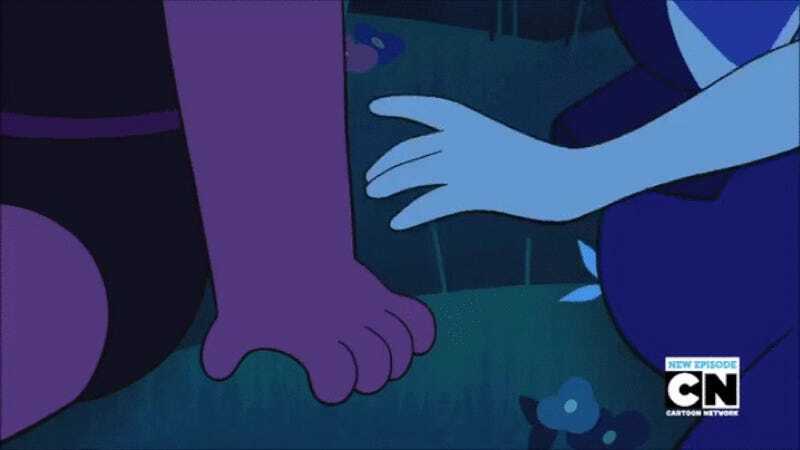 Elements that fans have speculated about almost since the show began—life on Earth when the Homeworld Gems first discovered it, Rose and Pearl’s rebellion as the Crystal Gems, even the Gem society’s class structures—all got their dues in a whirlwind few minutes, as the episode quickly revealed its real meat: the story of how Ruby and Sapphire first met, and formed into Garnet. It might not be the entirely specific breakdown that fans might have desired when it came to Garnet’s origins, but it was lovely—and as Garnet says at the very end, when love is the answer, sometimes it’s all you really need.